Rhea Silva (Silvia) was forced to become a Vestal Virgin—a woman who took a thirty-year vow of celibacy and service to the goddess Vesta—by her uncle, King Amulius of Alba Longa. 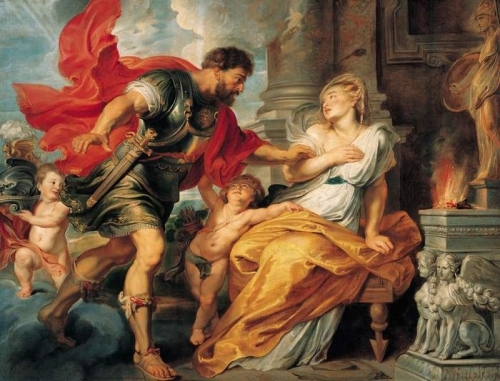 Amulius’ goal was to prevent the birth of heirs that could usurp his power, but his plan was foiled when Rhea Silva was raped by the god Mars and bore twins, Romulus and Remus. The king decreed the deaths of Rhea Silva and the infants, but a servant helped them escape, setting them adrift on the Tiber. The river god Tiberinus rescued them, marrying Rhea Silva and handing the twins over to the care of a she-wolf. Romulus and Remus would eventually found the city of Rome, although Romulus would kill his brother in a dispute over power.